golden amber leaves offset the dullness of the clouds. lulled by the calm of the fall, we sit gazing. embracing quietude and what the morning beholds. Thank you Baraka and all the artists that have been gathering with the intention, desire and exploration for the Re-Framing of the creative/collective process that is Re-Frame: A Gathering Project. Currently living in Puerto Rico and sharing via skype and phone with Baraka and the artists. Time moves ever so quickly and so dynamic with all the creative energy flowing in all directions. I made the decision after 12 years living in the US where I was able to study, train, work, collaborate, create and perform in a interdisciplinary ways to return what i call the beginning. A place where discovery was the ingredient and the unknown was scary. My spirit is one of constant movement and the decision to return to the place where it all began, Puerto Rico has been an experience of both many discoveries and challenges. The opportunity to co-facilitate this project with Baraka de Soleil is a unique and exciting experience. I bring with me the passion and commitment to develop and promote spaces where discovery and risk are core values of the process for creation. Based on the “Law of two feet” that is crucial for the creative process for collaborations that is the Open Space Technology(OST) framework used in this project, artists walk into a space of discovery. I thank them all for entering the space of Rumble Arts Center and that later on will continue the flow to Links Hall. The days are passing by and the enthusiasm continues to built up. Thanks again to all the supporters of this project who have donated, spread the word and shared their thoughts with us. See you all December 5th when I will be arriving to enter the space as both a facilitator and an artist. We still have 28 days to achieve our goal please continue supporting this project. See you all at the Gathering. wanted to share insight into Re-Frame’s creative lineage: The frameworks of this process are drawn from my experiences in Minneapolis, Chicago, NY & Panama. Liz Lerman’s critical response method has been part of my creative ‘upbringing’ since the mid 90’s in MN; experiencing this protocol at Intermedia Arts & Walker Art Center. Open Space Technology is a model i was introduced to through a NY arts organization [Arts Connection] focused on teaching artists & deepening their relationship to each other, the organization staff and teachers, principals of schools we were collaborating with. As an artist inside the process, i had the privilege to return to Minneapolis in 2009 and experience the illuminating convergence of both protocols at Pangea World Theatre; through a challenging and exciting projected entitled “Bridges”, curated by J. Otis Powell in alliance with Pangea’s Dipankar Mukherjee & Meena Natarajan. Bridges brought together artists from various cultural, aesthetic and disciplinary backgrounds to engage in a creative collaborative process. So inspired by this experience, i sought to continue developing processes that brought diverse groups of artists together and in 2010, had the opportunity to go to Panama to work on a landmark project, “Agua/Tierra”, co-facilitated & produced with two other artists Awilda Rodriguez Lora and Tanisha Christie and co-produced by Katie Zien [who initiated the project]. The core of this multidimensional project was a coming together of Panamanian artists from distinct and diversified aesthetic background to cross-pollinate and generate a hybrid performative experience. It was phenomenal! In alignment with the critical response & Open Space, as an artist i have been honored to work inside a form that has come to be known as the ‘Theatrical Jazz Aesthetic‘; fostered by acclaimed theatre artist Sharon Bridgforth, along with Dr. Omi Osun Joni L. Jones and an incredible lineage of artists who initiated this legacy… A deepening of understanding & facilitating what that legacy/aesthetic had to offer, having multiple discussions with Awilda, organizations & artists within the Chicago community leads to this moment of Re-Frame…seeking to craft a space that not only honors the making of art, but delves into the practice of the creative process; moving beyond one’s individual practice into a communal setting.. 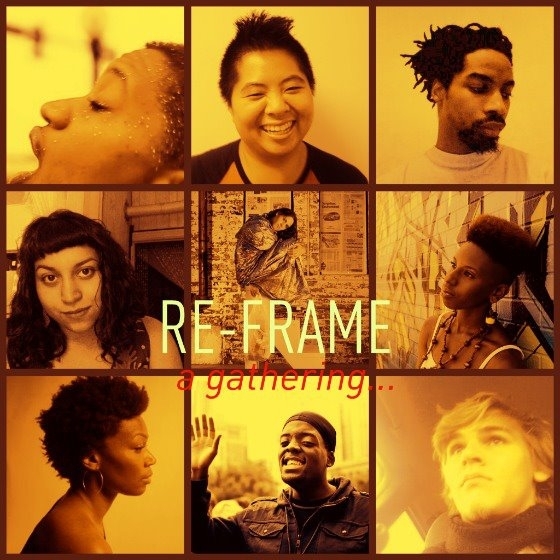 This is going to be one beautiful challenge & i am excited by the artist participants who have committed to being at the core of this project…by mid-December, all multiple communities will get a chance to witness what it has meant to be part of Re-Frame: A Gathering! as an artist facilitator, i discovered that i need to talk less and listen more and let them take hold of this space…shape it as they desire…it’s a challenge and a necessary joy! They began to discuss online “as an artist, what has been meaningful to you in the creative process?”.